Percy Street BBQ is offering a new plate worthy of your attention: a charcuterie board of artisanal American ham. Chef Erin O’Shea has sourced the all-domestic cured ham plate from some of the best ham producers in the country, all of which will rotate in an out of the dish to show off some of the country’s best. From Virginia to Tennessee, O’Shea picks her favorites to complete the selection. 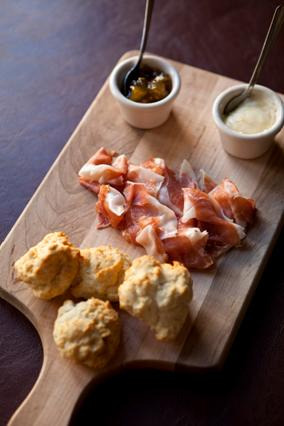 For $12 customers can enjoy the dish with not-to-be-missed homemade drop biscuits and green tomato preserves. Sound out of your budget? Well during happy hours from 5 to 6 p.m. Monday-Friday, the plate is just $6. Better, right? Turkeytails and BBQ fries are half-price during Happy hour too.